When it comes to mics, the old adage 'you get what you pay for' rings true. That's not to slight the efforts of budget and mid-market mic manufacturers, but to get this level of sound quality, along with great design virtues and a build that suggests reliability won't be an issue, you have to be looking in this price range. The sound quality these mics produce is breathtaking and, considering their size, is nothing short of remarkable. Desirable miniature clip-on model. Easily adjustable and reliable clamps. Make sure your PA system is up to the same standard before investing in a set. The most desirable of all drum mics are the sort of miniature clip-on models known as micro mics. In live scenarios, small microphones tend to fare better, being easy to position and less likely to be caught by a stray stick. The most desirable of all drum mics are the sort of miniature clip-on models known as micro mics. AKG's newest micro mic is the C518M, which supersedes the previous C418 model. Up for review are ﬁve C518Ms, which are suitable for mic-ing toms, ﬂoor toms and snares, and one of the AKG's classic D112 mics, which caters for the kick drum. The C518M is a high-gain cardioid microphone with a frequency response of 60-20,000Hz, which has been tailored to match drum frequencies. The sensitive parts of the mic are encased within a protective cap of plastic and mesh. This mic head is smaller than a thimble and sits on top of a 50mm length of bendable gooseneck. Between the end of the gooseneck and the mic head is a shock mount, which absorbs any vibrations, preventing them from interfering with the mic's performance. The whole assembly pivots through 135 degrees via a ratcheted mechanism. At the back end of the gooseneck is a mini XLR socket, which the supplied 3m-long lead plugs into, culminating in a full-size female XLR socket. As a condenser mic it requires a power supply to operate - easily achieved by engaging Phantom Power on the mixing desk. The rim clamp is a well thought-out piece of design, which mounts the mic quickly and ﬁrmly. The clamp works like an adjustable spanner, consisting of a pair of adjustable jaws. Attaching the clamp is a case of ﬁnger-tightening the jaws to the appropriate depth of rim. The clamp then holds fast. 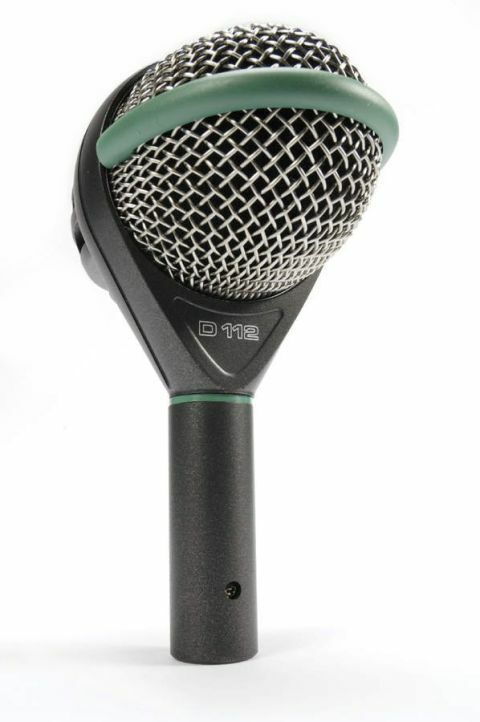 The D112 is a dedicated bass mic renowned for its ability to capture low frequencies. With a frequency range of 20-17,000Hz, it is not only suitable for mic-ing bass drums, but also bass guitars and lower register brass instruments. Setting up the C518M mics was simplicity itself - just clamp them onto the drums and plug them in. They proved to be very sensitive, and little was required in the way of gain at the mixing desk to put the drums right up in the mix, with minimal EQ-ing needed to achieve a superb quality of sound. The toms were reproduced almost intimately, with every growl and shudder from them coming through with hi-ﬁ clarity. Out front, we half expected to be able to feel the movement of air that accompanied each strike. The snare drum was equally deep and meaty sounding - if anything, it erred on the dry side and a little top-end had to be dialled in to release some of its natural bite, which made a pleasant contrast from the usual routine of trying to calm a wild-sounding snare. The D112, meanwhile, captured the bass drum with typical ﬂair, delivering a rock solid, mineshaft-deep low frequency masterclass that left the doors to the venue rattling in appreciation.